To live each day to honor him. But today, and tomorrow you live. This weekend I thought a lot about falling. Would you consider falling a one-time thing, an event that happened, a moment in time that you fell, the act that is done and over? Or would it be a process, the moments leading up to the hitting the ground, something that was orchestrated to happen? Multiple actions that create a fall? I think I believe it is the latter. A process that is orchestrated, realized and internalized up until that very moment you hit the ground. I think you can begin to fall long before you actually have impact. It’s embracing the fact the inevitable will happen. If you don’t fall sometimes, do you ever truly live? Sometimes you will end up on crutches. But maybe one day a fall will allow you to fly. I can’t wait to fly. Happy Holy Week My Friends. 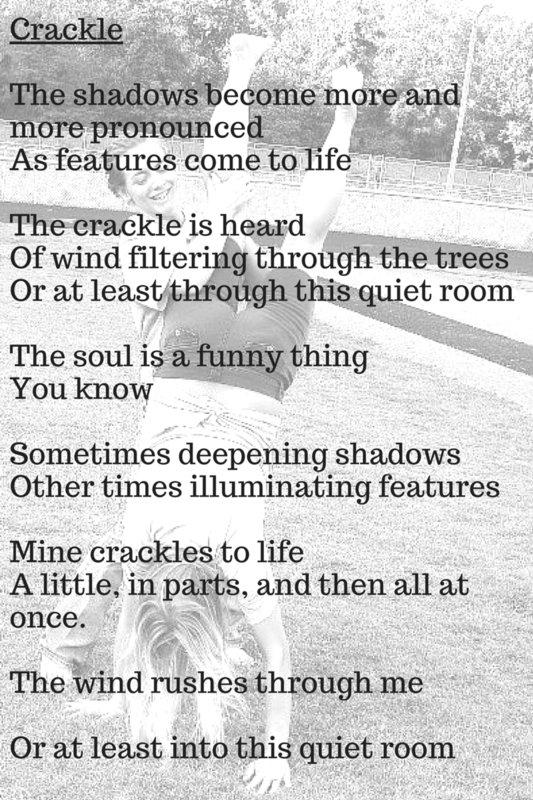 I love the Crackle poem! Beautiful thoughts, thank you for sharing them.